ARCHITECTURAL AND ENVIRONMENTAL F or a small piece of equipment, the standoff has come a long way. 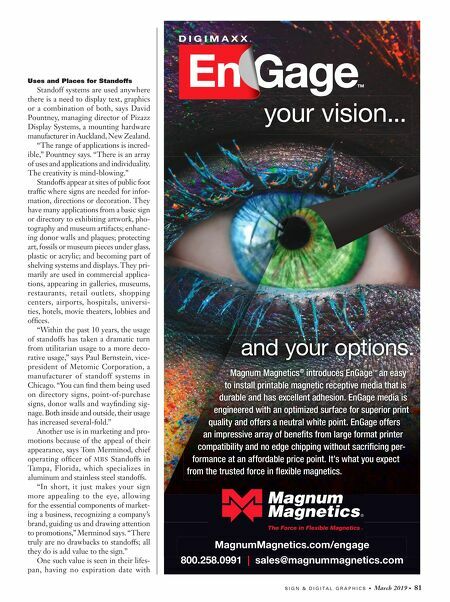 Standoff systems originally were used to protect museum displays, but now they appear in multiple places from fast food chains to corporate offices. They expanded from a utilitarian application to hold up signs and protect objects on display to decorative, eye-catching augmentation and design. "It definitely looks a lot nicer than driving screws in corners. It defi- nitely gives the product a much richer look," says Robert Borden, tech lead for the sales team at Gyford Standoff Systems, a standoff solutions company based in Reno, Nevada, now owned by Rowmark, LLC. "It takes it more toward an art installation look than just being signage... it makes it look like a higher-quality product installed on the wall." Standoff systems hold signs away from the wall or other mounting surfaces, creating a drop shadow and making the signs stand out more and appear more substantial, while giving them aesthetic value, Borden says. "It creates a visual interest instead of being flat against the wall," Borden says. 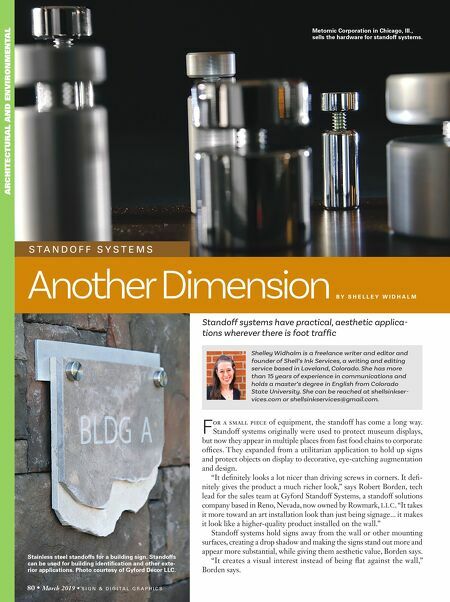 Another Dimension Standoff systems have practical, aesthetic applica- tions wherever there is foot traffic B Y S H E L L E Y W I D H A L M Metomic Corporation in Chicago, Ill., sells the hardware for standoff systems. Shelley Widhalm is a freelance writer and editor and founder of Shell's Ink Services, a writing and editing service based in Loveland, Colorado. She has more than 15 years of experience in communications and holds a master's degree in English from Colorado State University. She can be reached at shellsinkser- vices.com or shellsinkservices@gmail.com. 80 • March 2019 • S I G N & D I G I T A L G R A P H I C S S T A N D O F F S Y S T E M S Stainless steel standoffs for a building sign. Standoffs can be used for building identification and other exte- rior applications. Photo courtesy of Gyford Décor LLC.